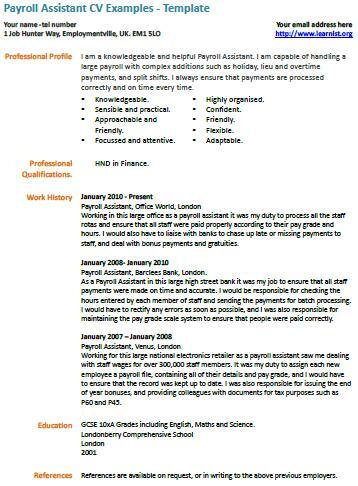 Payroll Assistant CV Example – Template. Amend as suitable and create your own CV in minutes. You can then apply for latest job vacancies. You can find many Payroll jobs once you visit those job sites online. If you are also in need of writing a covering letter then why not check out cover letter examples that are written by us too. You may be interested reading interview questions and answers too if an interview day coming soon for you. I am a knowledgeable and helpful Payroll Assistant. I am capable of handling a large payroll with complex additions such as holiday, lieu and overtime payments, and split shifts. I always ensure that payments are processed correctly and on time every time. Working in this large office as a payroll assistant it was my duty to process all the staff rotas and ensure that all staff were paid properly according to their pay grade and hours. I would also have to liaise with banks to chase up late or missing payments to staff, and deal with bonus payments and gratuities. Payroll Assistant, Barclees Bank, London. As a Payroll Assistant in this large high street bank it was my job to ensure that all staff payments were made on time and accurate. I would be responsible for checking the hours entered by each member of staff and sending the payments for batch processing. I would have to rectify any errors as soon as possible, and I was also responsible for maintaining the pay grade scale system to ensure that people were paid correctly. Working for this large national electronics retailer as a payroll assistant saw me dealing with staff wages for over 300,000 staff members. It was my duty to assign each new employee a payroll file, containing all of their details and pay grade, and I would have to ensure that the record was kept up to date. I was also responsible for issuing the end of year bonuses, and providing colleagues with documents for tax purposes such as P60 and P45.